Using a RTK receiver in fixed mode, you have X, Y and Z coordinates with an high accuracy ( < 2 cm ). making it no longer necessary to have a tide gauge connected to the software, or to correct the sounding afterwards. In order to calculate tide levels in real-time, you need a RTK receiver with a valid correction signal. This correction signal can be provided by a GSM / GPRS ( NTRIP ) service provider, UHF base station or your own base station on a known location. NOTE: When your RTK receiver does not have a built in cellular modem to make connection to the internet, but your computer does have an active internet connection, you can use the 'Hydromagic NTRIP Plugin' to feed RTCM correction data into your RTK receiver. You also need a local geoid model. This is a file containing geoid - ellipsoid separation values for the area or country you are performing your survey. 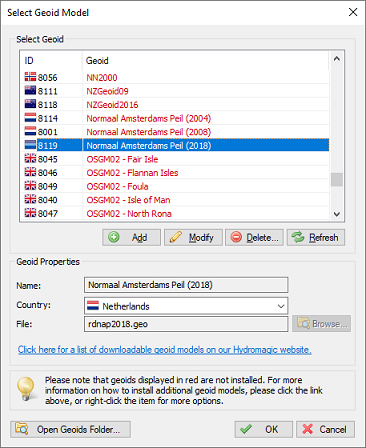 Hydromagic ships with a couple of geoid models, including Belgium, the Netherlands and North America. 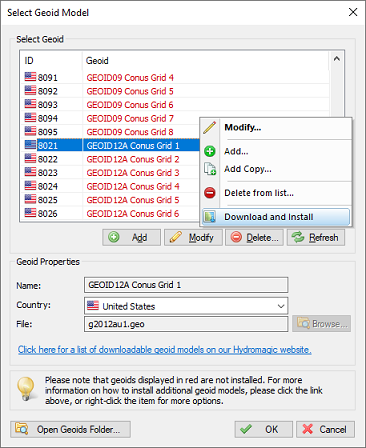 Additional geoid models can be downloaded free of charge from the "geoid download page". If no geoid model is available for your area, please contact support for assistance. To perform the calculation, you also need to know the exact distance between the receiving element of your RTK antenna and the water surface. When the Trimble proprietary NMEA0183 message is used, the ellipsoidal height is provided directly in the sentence, in the example above it is in the ellipsoidal height (10) "EHT35.7424" field. For standard NMEA0183, the ellipsoidal height is calculated from the M.S.L. (9) height and geoidal separation (11) field. In this case the ellipsoidal height is calculated by using the formula below: In the example above, the ellipsoidal height is 6.573 + 26.799 = 33.372 meter. Please not that the M.S.L. ( Mean Sea Level ) height value returned by the GPS is calculated using the global EGM96 geoid model, and isn't accurate enough to use for your surveys. This is why you have to provide a local geoid model instead. In order to configure Hydromagic to use RTK tides, open the preferences dialog by selecting "Preferences..." from the "Options" menu. 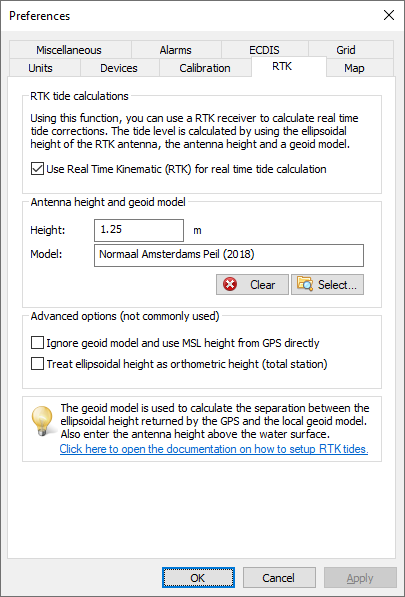 To enable tide calculation, you have to check the "Use Real Time Kinematic (RTK) for real time tide calculation" box. When checked, you can alter the other configuration options. First you have to enter the height of the antenna above the water surface. Make sure to measure this distance as accurate as possible, an error in this measurement is directly converted to an error in the tide level. Secondly, select the geoid model used in your area by clicking the "Select..." button. For some area's it is possible to select a vertical reference, like NAVD88, NVGD29, M.S.L. etc. Please note that this setting is ignored for some (most) countries. When finished configuring, just click "OK" to apply the settings. When selecting a geoid from the list, you may have noticed that some models are displayed in 'red' while others are displayed in 'black'. Geoid models that are displayed in 'black' are already installed because they were shipped with the Hydromagic installer. When you need to use a geoid model that is displayed in 'red', you have to download it first. ` After downloading and installing the geoid model should be displayed in 'black'. If not there was a problem with the download. 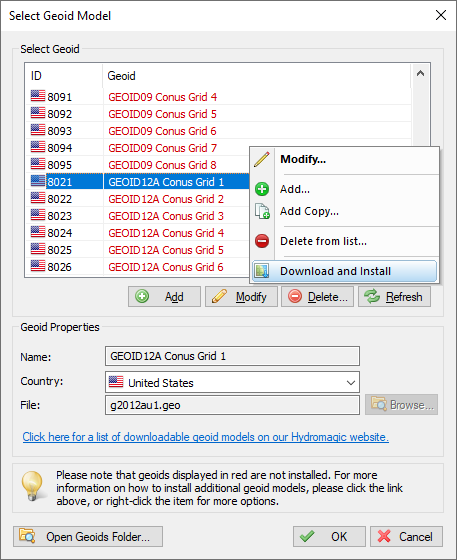 You might want to retry another time, or download and install the geoid model manually, which is explained on the "geoid download page". Normally you do not have to use these settings. In some cases they are needed though to get a good result on the height readings. When your height measurement is far off, please try these settings to see whether they fix the error. Another cause of height measurement errors is selecting a missing geoid model. Always check whether the geoid model used is installed (see previous chapter). Some newer RTK rovers have the ability to load a geoid model internally. This means that the orthometric height is already calculated by the rover. In these cases the orthometric height is returned in the MSL field of the NMEA0183 GGA sentence. If this is the case, select this option. This options should be used when a total station is used which outputs XYZ data in a pseudo NMEA0183 GGA sentence. In this case no geoid model will be applied and the ellipsoid height field is used as orthometric height directly. 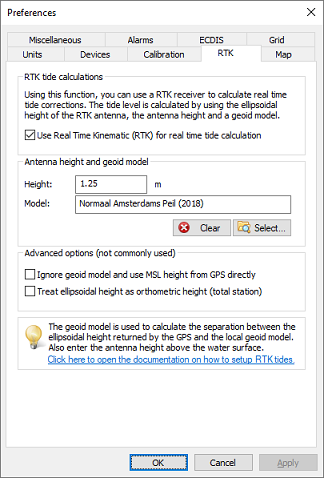 In order to test RTK tide calculations, connect and power on your RTK receiver and make sure you have a valid RTK fix. The next step is to check the values in the "Navigation Data" window. If this view isn't visible, you can activate it by selecting "Navigation Data" from the "View" menu. The RTK tide value is displayed in green. When the conditions above match, you can just start a new recording and proceed with your survey. When generating a sounding from your raw data files, you will be able to correct the tide settings if needed.